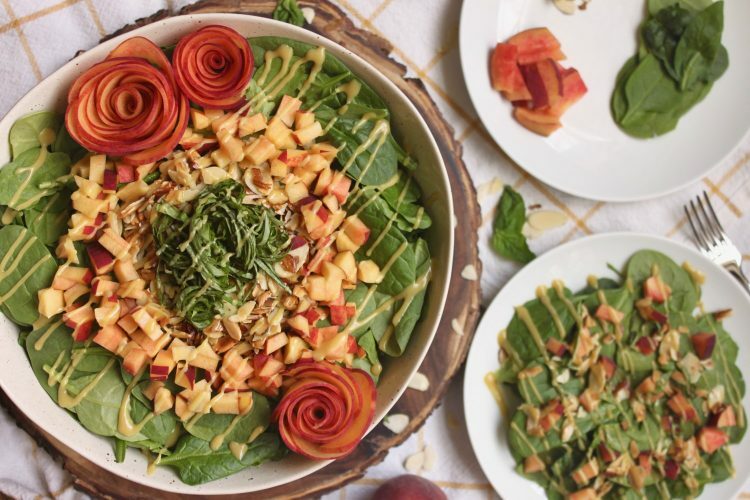 This Peach Basil Spinach Salad with Toasted Almonds is my favorite to bring to summer cookouts. The combination of juicy sweet peaches and salty toasted almonds is delicious. But it is the unexpected taste of fresh basil that really makes this salad amazing. With just seven ingredients (including the dressing), this peachy spinach salad is quick enough for a weeknight. However, it can be easily doubled and does not wilt quickly, so it is a fantastic choice for serving at a summer cookout. And because this salad is vegan, there are no eggs or mayo in the dressing to spoil if it stays out in the summer heat. This recipe serves four people. However, it is hard to not want seconds of this salad, so I always double or triple the recipe if I am making it for a cookout with friends. 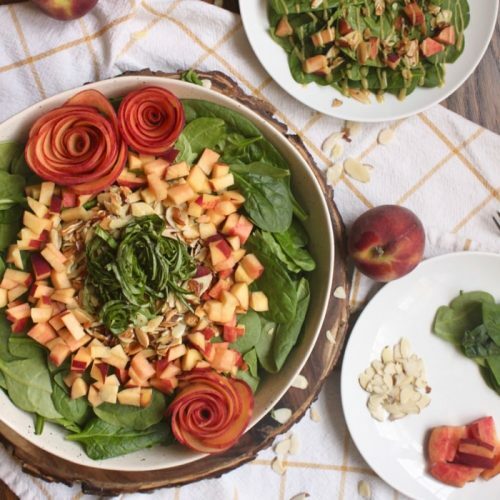 Fresh peaches, basil and toasted almonds combine to make this spinach salad a crowd-pleasing favorite! Optional: to make peach roses, slice peach halves into 1/8 inch thick slices and follow instructions for apple roses (without baking the peaches). *Notes: Spinach and peaches consistently test positive for pesticides in the USDA’s Pesticide Data Program, so I choose to purchase organically raised, when I can. Read more on pesticides and produce. Peel peaches unless using organic. 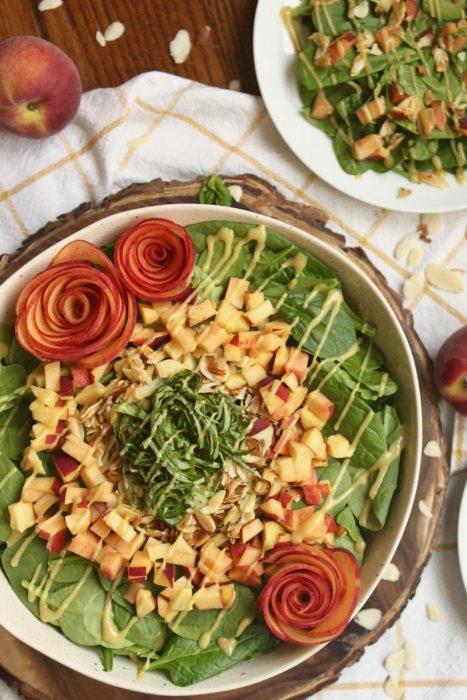 This peachy spinach salad is the first salad my boys would eat without complaint. To start, I served the salad deconstructed (pictured, learn more about why serving deconstructed meals work well for children). Now, my older son happily eats this peachy spinach salad fully tossed with dressing. His favorite parts are the sweet peaches and the salty toasty almonds, which he says taste like bacon. This recipe was originally published in April 2017. The instructions and description have been updated along with the photos. Oh my goodness, this has me so excited for all the summer peaches to come! What a great combination of ingredients, and I love huge salads! Thank you Kari! We are *happily* inundated with peaches and nectarines right now… so this salad is appearing at least weekly on our dinner menu! I hope you enjoy it too! What a lovely flavor combination. So refreshing and perfecto for summer too ! This salad looks anything but boring! I love the flavors in this, it’s perfect for summer! Thank you Liz – I hope you love this salad as much we do! I know exactly what you mean by the sweet fruit and salty almonds pairing together as being soo delicious! I’ve never tried it with peaches and almonds, but this salad recipe sounds delicious. Thanks Tina! Sweet, salty & crunchy are definitely the magic trifecta for my family… even my 3 yo loves this salad (combined with dressing!) . I hope you love it too! That topping of peaches and your dressings: big heart eyes!! SO yummy!! This is so pretty, I love those pretty peach roses you made! Such a lovely salad – the sweet dijon dressing sounds delicious, so does the basil. So much flavor in this! Thank you Emily! 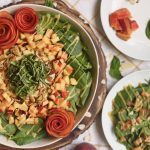 The basil really adds so much flavor to this salad, and the small amount of maple syrup in the dressing brings out the peach-y flavor. I hope you enjoy the salad! This is so beautiful – perfect for a potluck BBQ this weekend. Sometimes the simplest dishes are the best! Thanks Karen! I couldn’t agree more… simple, delicious recipes are often best. And this salad is an amazing addition to a potluck – I hope you enjoy it as much as we do! I always admire your food roses! This is such a pretty and yummy fruit + veggie salad! Thank you Lindsey! I *love* making delicious and healthy salads pretty. I’ve never had peaches in a salad before I need to try it out! Looks gorgeous and so refreshing. What a fresh and vibrant recipe! I need to step up my peach rose game like yours – gorgeous! I have to say I am OOBER excited for stone fruits, and this salad! What an amazing combo!!! Beautiful salad! You always make the prettiest food roses!